This deal looks interesting, too bad it's only for today! I don't get money till friday! oh well! The DAZ flagship figures promos generally last a lot longer than one day. They just get moved to a secondary banner to make way for the day's next sale. I suspect there will be a lot of Sakura related releases in coming days. Yes, I kinda ment getting the added 2 free pro bundles. that is really awesome. I don't have any of the items in those. So it would be a super deal. Monique and Darrius lasted many days. I expect that deal to last for days as well. It always has in the past. The "buy bundle get previous bundles for free" deal. Please let us know when those eye morphs are ready, they look wonderful! really good!!! And dang, how did I miss those shaders??? I usually grab everything toon/shadery ASAP.... it must have slipped my notice when I was so busy working. :( Will need to wait for a sale, could barely get the Sakura base for now. Wishlisted and wanted! :) thanks for link! I like Sakura 8. I think she is the perfect Anime character, certainly looks better than Star, IMOP, and snatched up the Pro Bundle as well as a couple of add-ons. I guess this could mean that there will probably be no Aiko 8 coming out? I sure hope not. I am still hopeful that they have not retired Aiko. Aiko hasn't been "anime" for a few generations. Since Hitomi came out really. That was when they shifted Aiko to being more like a japanese RPG character (ie modern final fantasy) than an actual "anime" looking gal. Aiko has her place, but she shifted a long time ago. I expect she will be back this generation and will likely fit into her own universe as always. in the past few years (since hitomi) Daz has experimented with anime-like figures. So I think Sakura is just a continuation of that, and in no way negatively impacts Aiko. Also, remember that Gen 7 gave us both Aiko AND Keiko because the two were so distinct. Oh no, I noticed that the Keiko bundle is the Mega Manga bundle. I wrangled some money to together and slapped the purchase button! Oh no, this month has been to many good deals! LOL! thats how i feel. now i need to use all this stuff. One more render from me for a while (sorry for flooding the thread with them, I just love this character! :D). I have every G8 flagship female but Josie converted to male. It's not actually hard and a couple of them are surprisingly gorgeous. However we haven't had a matching male for any of them since Hiro 5, who matched Hitomi even though he'd previously been with Aiko. I bet the confusion over that was what murdered his sales..
especially when paired with her "partner"! That was a great look though for a certain community! (usually the age card is played the other way) haha good times. I wish I had the time to find some renders people made to show off how different they looked age-wise. I tend to start with base G8F and dial in this way I don't have to deal with Sakura's eyes. Or as agent unawares suggusts just delete them. Hmm, when I delete those eyes than I have empty eye sockets with no eyes. Thank you ro the quick reply. Like I said, you have to make them visible in the Surfaces tab. 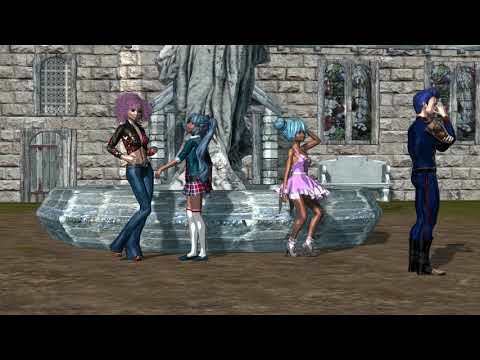 I liked Aiko 7, and her texture was fantastic, but yeah it was bizarre how old she looked. I liked Hitomi a lot too, and I wish she'd been marketted better alongside Hiro rather than not even making it to being an official figure. I'm a huge fan of Cookie, too, but the ancient technology puts me off using her much. My favourite until now was Haiku (who was basically just an adjusted head for Keiko) so we'll have to see if Sakura replaces her for my default anime girl. In the end I bought the base figure (despite there being no offer for her if you already owned the previous figures) the two Silver characters, and the Precious Tiger. The Pro Bundle was a better deal, but I didn't really need most of the stuff in it. Looking forward to trying them out!
. so far I'm having fun but I see limitations but I think once the spherical eye addon comes out I won't have any issues. She's got some good morphs that can be used in non-sakura renders IMO. which reminds me of Hitomi. Hitomi had eye morphs in particular that were useful even when u didn't use hitomi. Sakura has body morphs, face morphs that seem to also work well for other shapes. Leg, torso etc morphs that really make the character pronounced. Its a feature other "flagship" figures don't have. Compared to Hitomi and Sakura, most "figures" daz has released in genesis+ era are just shapes that aren't really needed. You can achive what you need with other dials often enough. And there isn't much variety of shapes in the set. However, with Sakura, they took care to address issues and styles people may want to have. She's really a gem. I wish she had more expressions in the pro pack, but I expect some may come later. Hopefully, unlike Aiko 7, they won't be encrypted content. I didn't buy the 2 A7 expressions until they were no longer encrypted, which was just a few months ago... shame cause they would have gotten much more use otherwise. She does look good surprised about no G3/7 character added to the freebie part, gather their wasn't one.. Ever since genesis they have not had true "figures", just shapes. So they have experimented more with releases and often many don't make it another generation. They said on the forum long ago that they wouldn't necessarily have the same "figure" in every generation. As you can see they more easily add "figures" and dump them each generation as needed. Only Vicky and Michael seem immune to purgatory. However, Vicky and Mike are also the most malleable, non-specific "figures" they release. They effectively are the first female and male figures of each generation. The only character that has remained unchanged since inception is really "The Girl" for better or worse. Long and short, Sakura bundles with two historic "figures" that may not get true sequels, but thats OK. She's her own thing that is awesome. (And I have some bias since I never cared for Keiko or Callie, and did not buy them. But am a big fan of Hitomi and legacy Aiko3/4). 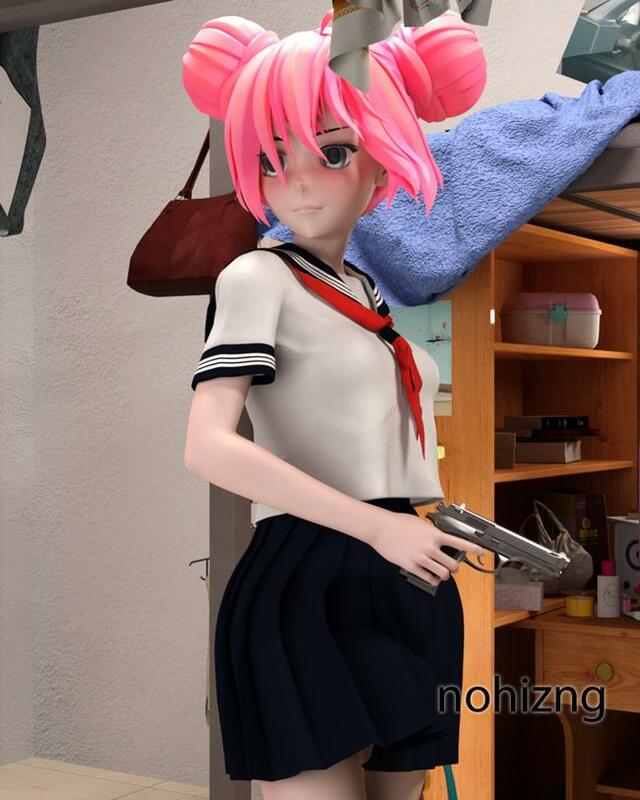 Intriguing render - high school girl with a gun. Hmmm I hope nothing bad is about to happen. lol :P (In my mind she's in a story in which she's an assassin - Joss Whedon Dollhouse style lol). Well, with my loyalty discount the pro bundle was too hard to pass on. I made a render with items from it. However, the skin is not hers. Guess who? I had a feeling that using Lady LittleFox's eye trick might help some renders. 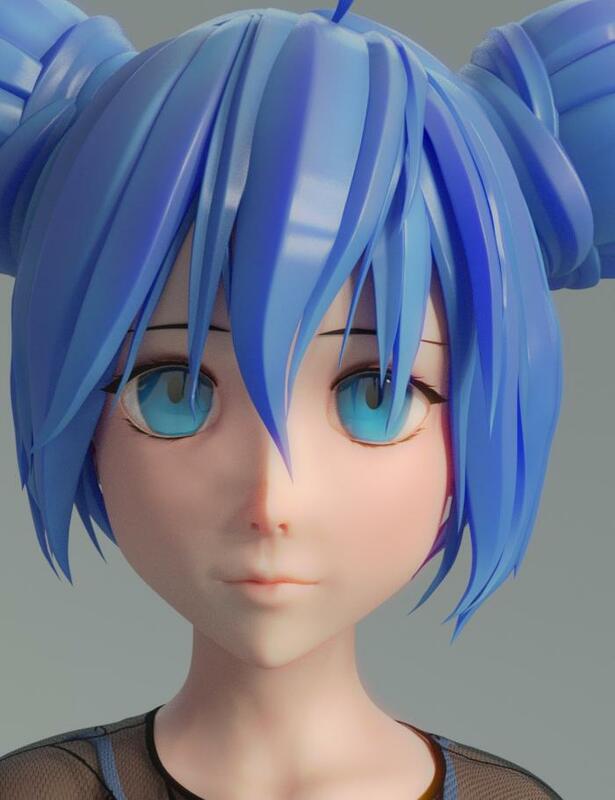 In some cases, Sakura's eyes are either too dark or the real reflection from Iray does not go well with it. So what I did is turn off all reflection values, hide the lens, and turn the eyeball itself emissive. I used the same eye texture for the emission profile, and set the color to a light gray (too white and it can wash out the color.) I cranked the luminosity to around 11k for this render. This makes the eye a bit brighter, but not so bright it stands out like a light bulb is in her head. The luminosity value needed will depend on the scene lighting. Again, I'm using a skin not from Sakura's bundle. I think it is perfect for Sakura. Oh that turned out great! Could you share her eye shader with us? Or a screen shot of the settings? :) I love what you did and the look it gives - but I had a little trouble following your explination of what you did. But did you convert them via a conventient scirpt like GenX or Singular Blues' or did you do it all yourself with Transfer Utility and all the OBJ & ERC work involved with it? Transfer Utility. What OBJ and ERC work? There wasn't any. What a beautiful figure. Anime is not a genre that I generally work with, but Sakura looks so good that I had to have a go.